1970 – Four new aluminum producers had smelters under construction in the U.S. at the start of 1970, and a fifth new producer was considered likely. Thirty-one smelters operated in the U.S. by 1972: Alcoa with eight, Reynolds seven, Kaiser four, Anaconda two, Harvey two, Comalco one, Intalco one, Ormet one, Eastalco one, Gulf Coast Aluminum (later Conalco) one, National-Southwire one, Noranda one and Revere one. 1970 – Harold and Mabel Dehlbom became the first plaintiffs to sue the Anaconda Aluminum Co. plant in Columbia Falls for damages caused by fluoride emissions and air pollution. The Dehlboms asked for $2.38 million in their April 16, 1970, complaint. University of Montana botany professor Clancy Gordon supplied data for their case. More than a dozen other cases were later filed, including a class-action lawsuit filed by Columbia Falls resident Loren Kreck on Sept. 15, 1970, that sought $21 million. 1970 – The Anaconda Aluminum Co. announced plans on July 24, 1970, to spend more than $100 million building a 120,000 ton-per-year aluminum smelter at Sebree, Ky. Designed to increase in capacity to 240,000 tons per year, the new plant would be built on the Green River by Alcoa. 1973 – The Anaconda Aluminum Co. became a totally vertically integrated company in 1973 after its Sebree smelter helped the company become a net seller of aluminum. Production from the Columbia Falls smelter had been insufficient to meet the needs of AAC’s fabricating plants, and the company was forced to purchase primary aluminum on the open market. 1973 – The Anaconda Aluminum Co. requested a variance from Montana’s fluoride standards on June 30, 1973, while it looked for a solution to its fluoride emissions problem. The Columbia Falls smelter had brought emissions down to 2,500 pounds at full capacity with new pollution control equipment, but the state standard for the plant was 864 pounds per day. 1976 – The Anaconda Aluminum Co. signed a formal contract with the Sumitomo Chemical Co. Ltd. of Japan in summer 1976 to purchase the rights to use Sumitomo’s aluminum reduction process technology, which would consume less electricity and emit less air pollution. AAC planned to spend $35 million from 1976 through 1980 converting the 600 reduction cells at its plant at Columbia Falls to the Sumitomo design. 1976 – The Anaconda Aluminum Co. signed a $7.2 million contract with Alcoa in December 1976 for use of Alcoa’s Method 398 dry-scrubber technology for controlling fluoride emissions in pot gases. 1976 – The Atlantic Richfield Co. (ARCO) began to purchase Anaconda Company stock in 1976 after the mining company lost its valuable copper mines in Chile and survived several hostile buyout attempts. ARCO’s acquisition was completed in 1980 after the Securities and Exchange Commission required that a federal air pollution lawsuit be settled first. 1978 – The Anaconda Company announced in February 1978 that it had joined with Alcan and Billiton to build a $500 million 800,000 ton-per-year alumina refinery in Aughinish, Ireland. Anaconda would take 25% of the production. 1978 – The U.S. Attorney General’s Office filed a lawsuit against the Anaconda Company on Nov. 3, 1978, claiming fluoride emissions from the Anaconda Aluminum Co.smelter in Columbia Falls had damaged plants and animals in Glacier Park and on Forest Service land. 1980 – The conversion of reduction pots and installation of the new dry scrubber system at the Anaconda Aluminum Co. smelter in Columbia Falls was completed by February 1980. Plant pathologist Clinton Carlson said he noticed a dramatic improvement to conifers on Forest Service lands by July. The federal lawsuit was settled out of court in July with a land swap between the Anaconda Company and the Forest Service. 1980 – ARCO closed down the Anaconda Company’s copper smelter in Anaconda and copper refinery in Great Falls in 1980. By early 1982, ARCO had also closed down the copper mines in Butte. The Anaconda Aluminum Co. smelter in Columbia Falls remained running, but ARCO was looking for a buyer. ARCO sold its Terre Haute rolling mills, Sebree smelter and its stake in the Aughinish refinery to Alcan in 1983 and sold its stake in the Alpart bauxite operation in Jamaica in 1985. 1985 – The We Want The Plant grassroots group helped assemble the largest gathering in Columbia Falls history on April 22, 1985, to protest the Bonneville Power Administration’s high power rates. Montana’s top government leaders joined local politicians and plant workers at the rally. A second large rally to support lower power prices was held on Jan. 29, 1986. A third large rally was held on June 1, 1993. The BPA noted that no other Pacific Northwest aluminum community came close to showing this level of support. 1985 – Former ARCO executive Brack Duker joined former aluminum industry manager Jerome Broussard to take over the Anaconda Aluminum Co.smelter in August 1985, which was renamed the Columbia Falls Aluminum Company (CFAC). ARCO sold the plant for a nominal dollar. Duker and Broussard also received support from government leaders, a loan from the state, and an agreement for a pay cut by hourly and salaried workers in exchange for future profit-sharing. The plan was to smelt alumina for customers under tolling contracts. 1989 – CFAC accountant Revo Somersille was fired by Brack Duker and Jerome Broussard in September 1989 after he raised questions about how the owners used the company’s profits. He sued CFAC for wrongful discharge in September 1990. 1990 – CFAC accountant Roberta Gilmore declined to sign a letter to CFAC’s auditors when she became concerned about how profit-sharing money was being distributed at the plant. Gilmore was put on administrative leave in February 1992 after she initiated a lawsuit on behalf of CFAC’s salaried employees over missing profit-sharing funds. 1992 – The Aluminum Workers Trades Council filed a formal grievance against CFAC on Feb. 13, 1992, claiming Brack Duker and Jerome Broussard failed to correctly distribute profit-sharing checks to the company’s union employees. 1992 – In November 1992, CFAC’s employees attempted to come up with a buyout plan to purchase the company while Duker and Broussard talked to other prospective buyers. 1993 – With a Soviet glut of aluminum driving down global aluminum prices and a Pacific Northwest drought forcing the Bonneville Power Administration to cut back power, CFAC was forced to curtail production after seven good years. Brack Duker and Jerome Broussard did not offer profit-sharing checks for 1993. 1993 – Roberta Gilmore was fired by CFAC in 1993. Two other employees in the CFAC accounting department and an electrical foreman were fired that same year after they questioned CFAC management about the profit-sharing dispute. 1995 – Jack Rogers, a Steelworker representative and ironworker at CFAC, gathered money from other workers at the plant to help install a neon sign with the letters “EFP” near the corner of Aluminum Drive and the North Fork Road. EFP became the slogan for workers angered by the profit-sharing lawsuit. 1995 – Eighteen security guards from the Asset Protection Division of Vance Security, a firm based in Oakton, Va., appeared at CFAC on Sept. 8, 1995. Union members claimed the guards were sent to Montana to intimidate the workers as labor contract negotiations approached. 1995 – A Norsk Hydro internal memo suggesting CFAC’s profit-sharing money might be hidden through use of a Cayman Islands-based shell company called Eural was made public in September 1995. It was also reported that Norsk Hydro and Shell Mining would not renew tolling contracts with CFAC because of the profit-sharing dispute. CFAC sued Norsk Hydro over the matter in October. 1995 – Sen. Max Baucus and Gov. Marc Racicot encouraged hourly workers to not strike and to agree to a new labor contract in October 1995. The new contract boosted wages and benefits 43% but eliminated profit-sharing. Union leaders noted that the increase was mostly offset by the concessions they had made in 1985. 1996 – The Environmental Protection Agency in spring 1996 found several visible seeps containing cyanide on the banks of the Flathead River near the CFAC smelter plant when the river was at low level. The source of the hazardous chemical was believed to be a leaking onsite landfill used to store spent potliner from 1955 to 1980. 1998 – CFAC’s union workers voted 4-1 on Jan. 6, 1998, to accept a $65 million offer to settle the profit-sharing lawsuit. The salary workers were offered $32 million. U.S. Judge Jack Shanstrom approved both offers in fairness hearings on Jan. 21 and 22. The $97 million settlement attracted national media attention and led to confusion, frustration and anger among workers and locals. 1999 – With the profit-sharing case settled, prospective buyers began to look at CFAC again. On May 21, 1999, the Swiss-based global commodities trading company Glencore announced it had purchased CFAC. Formerly known as Marc Rich & Co., the privately-held company had a notorious background, but workers and locals expressed optimism about the aluminum plant’s future. 1999 – Union workers approved a new labor contract with Glencore on Oct. 15, 1999, and Glencore invested in modernizing the potlines with computers and starting preventative maintenance programs. Glencore owned bauxite and alumina resources across the globe and essentially used CFAC as a tolling operation. Glencore acquired the Aughinish alumina refinery in February. 2000 – First signs of the West Coast Energy Crisis in the Pacific Northwest were seen in June 2000 when wholesale electric power prices averaged $180 per megawatt-hour and climbed as high as $1,100 during peak hours. June prices over the past three years had averaged only $16. Federal deregulation and a poorly planned power market system in California were blamed for the high power prices. Several Pacific Northwest aluminum plants shut down. 2000 – CFAC managers talked about layoffs in September 2000, and local politicians talked about building power plants in the Flathead Valley in October as the West Coast Energy Crisis wreaked havoc on Pacific Northwest power markets. Meanwhile, the Bonneville Power Administration agreed to sell 3,300 megawatts more power than existed in the federal Columbia River system and asked Pacific Northwest aluminum plants that were still operating to shut down and sell their contracted power back to the BPA to make up the difference. 2001 – CFAC completely shut down on Jan. 18, 2001, for the first time since the smelter began running in 1955. About half the workers were laid off, with wages and benefits provided for the rest of the year. The other half remained for maintenance and improvement projects. Seven of the Pacific Northwest’s 10 aluminum plants never recovered from the West Coast Energy Crisis. CFAC managed to hang on for eight more years. 2002 – CFAC announced it would restart Potline 4 on Feb. 12, 2002. About a month later, Glencore acquired the closed aluminum smelter in Vancouver, Wash., in bankruptcy court. 2002 – CFAC restarted three potlines by May 2002 as the plant struggled to survive in a weak metals market with high raw materials and power prices. The original two potlines in the West Plant were never restarted. 2003 – CFAC announced plans to shut down two of its three potlines on March 11, 2003. Layoffs at the plant coincided with a weak Montana economy, marked by declines in manufacturing, transportation, utilities and warehousing. 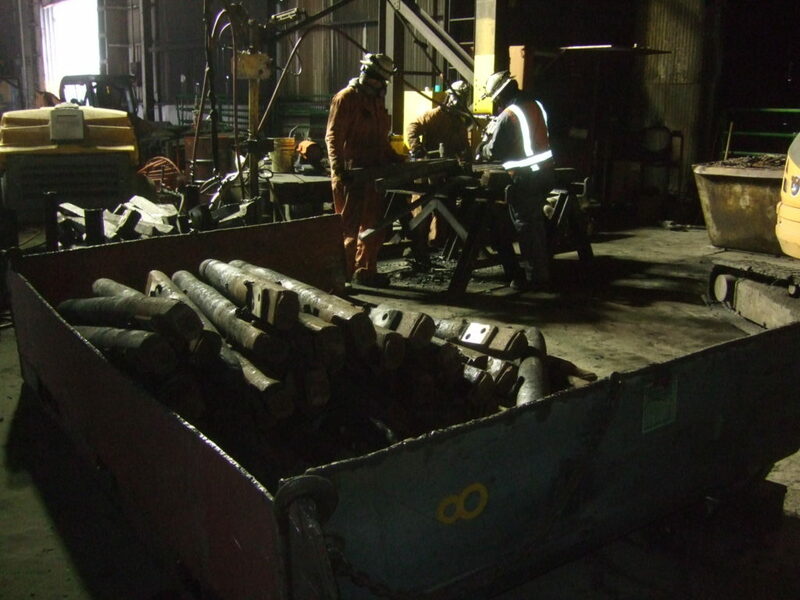 2005 – CFAC celebrated its 50th anniversary on Aug. 14, 2005, but the smelter was down to one potline and 150 workers, facing a continuing lackluster metal market and unable to secure economical long-term power contracts. 2009 – CFAC laid off 88 employees as it shut down operations for the last time on Oct. 30, 2009. Sens. Max Baucus and Jon Tester had tried to negotiate a favorable Bonneville Power Administration power contract for the smelter without success. Tester blamed Glencore for not taking BPA power offers seriously. 2011 – Glencore announced plans for an initial public offering in May 2011, which raised about $57 billion. Glencore and mining-giant Xstrata merged in May 2013, creating the world’s most powerful commodities trading company. 2011 – CFAC’s request for a 95% tax reduction was rejected by the School District 6 Board of Trustees and the Flathead County Board of Commissioners on May 9, 2011. Distrust of Glencore was a prevailing opinion at the joint meeting. 2012 – State senator-elect Dee Brown spoke to the Flathead County Commissioners in December 2012 about declaring the CFAC plant a Superfund site. Brown accused Glencore of “pretending” since the plant closed in 2009 that it intended to one day reopen the plant.The Environmental Protection Agency and the Montana Department of Environmental Quality also met in December about the CFAC site. 2013 – Three Glencore representatives met with the Flathead County Commissioners on April 24, 2013, in an effort to hold off talks about designating the CFAC property as a Superfund site. 2013 – An EPA environmental contractor in fall 2013 sampled soil, groundwater and surface water around the CFAC plant and drinking water wells in nearby residential neighborhoods where cyanide was detected. Follow-up sampling in 2014 did not detect cyanide in the drinking water wells. 2014 – CFAC broke off cleanup negotiations with the state Department of Environmental Quality on Dec. 9, 2014, and hired Roux Associates to conduct a remedial investigation and feasibility study for cleaning up the CFAC property. Oversight of the cleanup project fell to the Environmental Protection Agency. 2015 – CFAC announced the permanent closure of the aluminum plant in Columbia Falls on March 3, 2015. A political debate developed between local, state and federal politicians over whether the plant should be designated a Superfund site. Meanwhile, CFAC officials attempted to convince government officials that the cleanup responsibility fell on CFAC, not Glencore. 2015 – CFAC announced a demolition contract with Calbag Resources on April 29, 2015. Calbag bought the above-ground structures from Glencore and expected to make a profit selling equipment, chemicals and metal removed from the site. The Montana Department of Environmental Quality set strict conditions for the handling of hazardous materials, particularly asbestos and spent potliner. 2015 – The Environmental Protection Agency formally proposed placing the CFAC site on the Superfund’s National Priorities List on March 24, 2015. The Superfund debate intensified, with talk of a Superfund Alternate Approach that would avoid the stigma a Superfund designation potentially could cause to the Flathead Valley. 2015 – Ann Green Communications, a West Virginia public relations firm, was hired by Glencore in May 2015 to set up a community liaison panel to address local response to a Superfund designation. The firm selected the panel members and facilitated the meetings. 2015 – The Environmental Protection Agency and CFAC agreed to an administrative order on consent in November 2015 to direct the first stages of the smelter cleanup project. CFAC put up $4 million to pay for a remedial investigation and feasibility study that called for 126 soil borings and 43 new groundwater monitoring wells. 2016 – The CFAC smelter property was officially placed on the Superfund’s National Priorities List on Sept. 9, 2016. CFAC had spent $2 million by that time on a remedial investigation and feasibility study for the site. The feasibility study would not be completed until at least 2020, according to the EPA. Actual cleanup of the contaminated landfills and ponds onsite would take place after that.